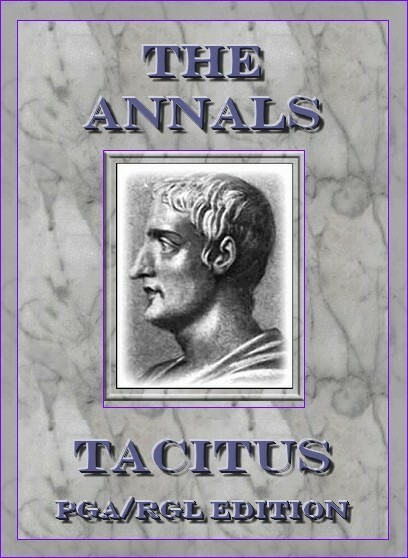 The Annals was Tacitus' final work, covering the period from the death of Augustus Caesar in 14 AD. He wrote at least sixteen books, but books 7–10 and parts of books 5, 6, 11 and 16 are missing. Book 6 ends with the death of Tiberius and books 7–12 presumably covered the reigns of Caligula and Claudius. The remaining books cover the reign of Nero, perhaps until his death in June 68 or until the end of that year, to connect with the Histories. The second half of book 16 is missing (ending with the events of 66). We do not know whether Tacitus completed the work or whether he finished the other works that he had planned to write; he died before he could complete his planned histories of Nerva and Trajan, and no record survives of the work on Augustus Caesar and the beginnings of the Empire with which he had planned to finish his work. — Wikipedia. Book 1.1-15 The death and funeral of Augustus; the accession of Tiberius. Book 1.16-30 Drusus and the mutiny of the Pannonian legions. Book 1.31-54 Germanicus and the mutiny of the German legions. Book 1.55-71 The war in Germany. Book 1.72-81 Intrigues in Rome. Book 2.1-26 More war in Germany. Book 2.27-46 The opposition in Rome to Tiberius; Libo Drusus, Piso, and Asinius Gallus. Book 2.47-88 Intrigues in Rome; Tacfarinas' revolt in Numidia; Germanicus' grand tour through Asia as special foreign affairs envoy; Piso versus Germanicus; the death of Germanicus. Book 3.1-19 Rome after Germanicus: eulogies, intrigues, and adjustment. Book 3.20-39 Roman domestic politics and legal matters. Book 3.40-55 Revolt in Gaul; intrigues in Rome. Book 3.56-76 Intrigues in Rome: Tiberius versus Silanus; Tacfarinas' revolt in Numidia (continued). Book 4.1-22 Intrigues in Rome: the continued rise of Sejanus, who poisons Drusus; prosecutions of C. Silius and others. Book 4.23-31 The war against Tacfarinas comes to an end; more prosecutions. Book 4.32-45 The beginning of the fall of Sejanus. Book 4.46-56 War in Thrace; plots set in motion against Agrippina. Book 4.57-75 Tiberius abandons the capital for Campania; fire on the Coelian Hill in Rome; the condemnation of Titius Sabinus. Book 6.1-27 The purges after the fall of Sejanus. Book 6.28-51 The Parthian war; fire on the Aventine Hill in Rome; the death of Tiberius. Book 11.1-15 Claudius becomes emperor; in Rome Suillius prosecutes many; turmoil in Armenia. Book 11.16-38 Corbulo settles a Frisian revolt; Senatorial rights extended to the provinces; the debaucheries and execution of Messalina. Book 12.1-40 Claudius remarries; adjustments with Parthia; Nero adopted; the Pomerium enlarged; war in Britain against Caratacus. Book 12.41-69 The young Nero groomed to succeed Claudius; disorders in Armenia; extravagant inauguration of the draining of Lake Fucinus, which turned out a massive failure; the death of Claudius. Book 13.1-30 Nero becomes emperor and starts his slide into lust and cruelty; the murder of Britannicus; continued trouble with Parthia over Armenia. Book 13.31-58 Disaster strikes Roman army in Armenia, partly saved by Corbulo; revolts and wars among the Germans. Book 14.1-28 Nero murders his mother Agrippina; Nero exhibits himself as a charioteer; institution of the Neronia; Corbulo settles the Armenian problem in favor of Rome - at least for the time-being. Book 14.29-39 Britain - the Icenian revolt under Boudicca. Book 14.40-65 Criminal trials and political purges in Rome; the murder of Rubellius Plautus and the 20-year-old Octavia. Book 15.1-32 Roman defeat in Armenia portrayed as a victory; a further adjustment with Parthia under which the Parthian king, Tiridates, travels to Rome to become a nominal vassal. Book 15.33-47 Nero exhibits himself as a singer and a harpist; The Great Fire of Rome; Christians executed as scapegoats. Book 15.48-74 Piso's conspiracy and its failure. Book 16 Nero seeks to destroy the Stoic opposition; the murder of Paetus and Soranus.